PICNIC BACKPACK home decor, jewelry, decor, decorations, electronics, fountains, floor mats, art glass, vases, garden essentials, fireplace screens. 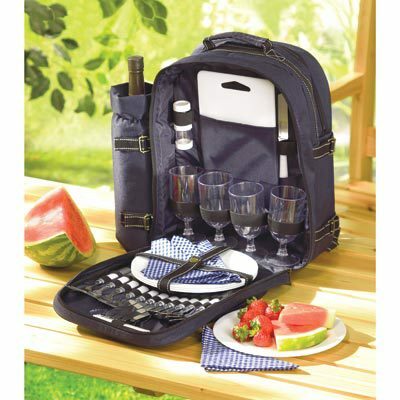 Have a gourmet picnic anywhere, with this convenient backpack set that includes everything except the food but leaves enough space for it! Place setting for four; 30 pieces. Material(s): PLASTIC POLYESTER MELAMINE. Weight 4 pounds. Dimensions 15" x 6.5" x 17".